ENGLEWOOD, Colo. (AP) Vance Joseph is either going to simplify his offense for Trevor Siemian or send him to the bench in favor of Brock Osweiler. Joseph complained that Siemian made ”three horrific decisions” on ”three horrible interceptions” in the Broncos’ 29-19 loss at Kansas City on Monday night, wasting another dominant defensive effort and negating any gains made by the offense. ”When your football team is putting in max effort and your defense is playing good football, it’s unfair to your team if you’re not discussing that position,” Joseph said. ”That wouldn’t be fair to our football team or Paxton,” Joseph said. Denver’s defense played exceptionally well Monday night . They held the Chiefs (6-2) to two third down conversions and stifled Alex Smith, in the midst of a breakout season. He was 14 of 31 for 202 yards and a touchdown. They even held speedster Tyreek Hill, who burned them so often last season, to two catches for 38 yards. 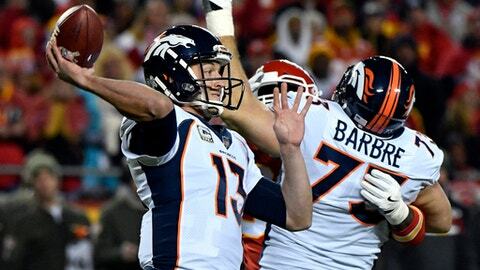 In addition to his three interceptions, Siemian was sacked three times, giving him 25 for the season. He’s on pace for 57 sacks this season – should he manage to stay in the lineup. ”As coaches, we can make his life a little easier by taking some of the variables away from him and not giving him so much,” Joseph said. ”I’ve said all along we can coach and play better. So, Mike understands that. And Mike every day voices that he can help Trevor more,” Joseph said. ”But the bottom line: players play and coaches coach. There are no perfect calls. You can try to make perfect calls for him but he has to play his way out of bad plays and not make them worse.